How do I add/edit my venue's min spends, hire fees, and pricing? Make sure you're receiving the most qualified enquiries by adding detailed pricing to your listing. Venues, you can set your pricing requirements for each function space across the year. Customers want minimum spends! This pricing acts as an enquiry threshold and qualifier, ensuring you only receive the most suitable and exciting event bookings via Venuemob. We know pricing differs throughout the year, which is why we can store prices as granular as each day of the week and month of the year. Pricing is SUPER IMPORTANT to customers, and is vital in their decision-making process. 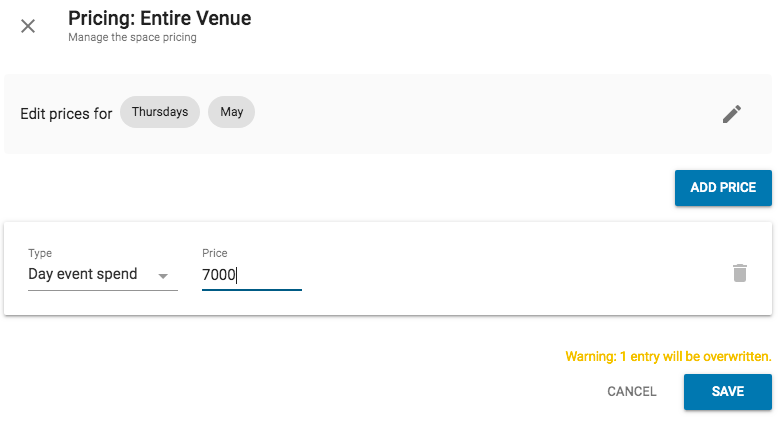 If you add pricing to your Venuemob listing, you WILL be boosted in search results, and you WILL be one step closer to becoming a Super Venue! How do I set/change my pricing table in bulk? Log into Venuemob Manager and head to Venue listing > pricing. From here, select Minimum spends and hire fees to set pricing data for each of your spaces. Once pricing is added, this section will change to green. Select the pen icon next to the space you which to add pricing to. Select Set Bulk in the top left hand corner of the table. We recommend starting with the lowest, or most frequent minimum spend requirement. For instance, if a space has a min spend of $1500 throughout the week and goes up on the weekends, start with $1500. Same goes for instances when there's a general price throughout the year that goes up in peak times (like December). Note: you'll be able to set different prices for day events and night events. Under Days, you can select entire weeks, specific days, or a single day for one pricing value to be applied to. Under Months, you can select a single month, or multiple months for this pricing rule to apply to. Then, enter your Price. This price needs to be a whole dollar amount. Please do not use commas to separate zeros. Next, select your price type. You can choose from food and beverage spend requirements for day or night events, or full day, half-day or hourly hire fees. You can enter as many of these prices for each space. You can also add/change pricing for a particular day/month combo by clicking on the calendar. 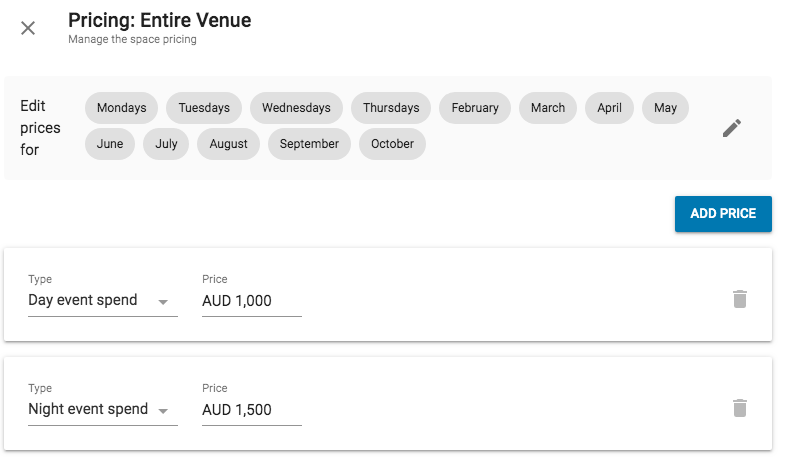 Say you wanted to change the pricing for Thursdays in May – by highlighting that date, and clicking, you can add pricing. You can even add more days in the next step. Pricing can be added or changed at any time. Once you set your pricing, it's not set in stone. Also, please note: this pricing is displayed as a min spend for events at your venue, but we display it knowing that every event will be different and, as such, each event will be a different price. But what if you're super flexible? This price is here to make sure you're receiving the most qualified enquiries possible, and the tool is designed to accommodate flexibility. Adding pricing will incentivise customers to enquire and book. Customers love to see how much something costs – our stats state this clearly. Also consider adding a price guide and package pricing to indicate to customers how far their budget will stretch for their event. Price guides allow venues to indicate what the minimum price per drink, set menu or main plate is. This is another way to further qualify leads. What if I have conditions attached to my pricing? If you have a couple of terms or conditions attached to a particular space, or for a particular time of year, you can make note of that in the Booking conditions and terms section. Think that listing pricing might put potential customers off? Our stats are clear: pricing is the number one factor that will push a customer to progress from interest to an enquiry.